Peaches Montgomery is the premier natural skin care salon in Montgomery, OH. Our philosophy is simple, but effective. We don't advocate for any invasive procedures, injections, chemical peels, or harmful methods of any kind. 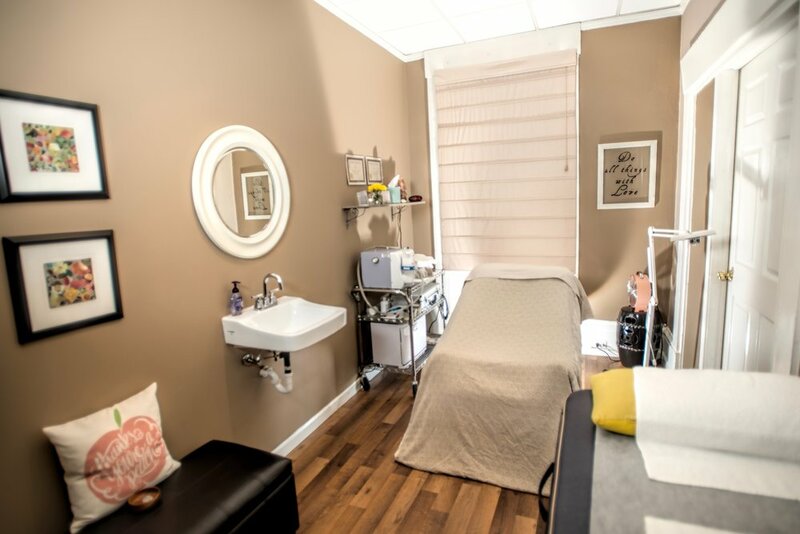 Our master estheticians have worked diligently for years on thousands of clients perfecting the single facial we offer, the Signature Peaches Facial. That's right, we offer one facial for all skin types. Our intensely developed facial works on skin types and conditions of all kinds. From those seeking a facial for anti-aging purposes to those suffering from light to severe acne, we can help you achieve your goal of perfect skin. Give us a chance to show you the Peaches difference. Peaches Skin Care made its debut in Cincinnati, Ohio in July of 2012, settling into a beautiful, historical building in the Cincinnati suburb of Montgomery. We are so excited to offer our unique services to the greater Cincinnati area! Bottom line — no one does what we do. We have over 25 years of experience and results using our signature facial. We use all natural products produced specifically for Peaches Skin Care that contain pure antioxidant ingredients. We stand absolutely 100% behind what we do, and our number one goal is improving clients’ skin and providing them with a routine that will maintain that perfect Peaches glow! We are easily accessible from all major highways, and our building can be found just a minute from Cross County Highway. Here you will find the only facial of its kind in Cincinnati and our experience has been that residents of Cincinnati welcomed us with open arms! Peaches Skin Care Cincinnati clients have seen dramatic results since opening the salon in Cincinnati – from the clearing of lifelong cystic acne, to the disappearance of wrinkles and sun spots. Peaches Skin Care Cincinnati can truly help all ages and all skin conditions. If you live outside of Cincinnati, do not let that stop you. We have clients driving from Columbus, Indianapolis, and southern Kentucky. Rest assured, it is worth the drive! Peaches is excited to continue to grow and help even more clients here in Cincinnati. If you are looking for a facial experience you won’t find anywhere else in Cincinnati, we would love to hear from you! The number to our Montgomery salon is 513-793-7500. You can also reach us via email at montgomery@peachesskincare.com. Aimee is a Cincinnati native who is excited to share her passion for skin care with her clients. Being an esthetician gives her joy because she gets the opportunity to make her clients feel better about themselves every day. Aimee can’t wait to share her knowledge she has gained at Peaches with more people in Cincinnati and feels the thorough, holistic approach gives unparalleled results. Meagen was born and raised in Cincinnati, Ohio. She is a licensed esthetician with certification in microdermabrasion and relaxation massage. She is passionate about skin care and beauty and believes everyone should have a smooth, hairless canvas! (Which you will have if you visit Meagen for her waxing services!) Meagen loves the unique approach and genuine care and concern that Peaches offers to their clients. Abby is a licensed cosmetologist that found her way into aesthetics. After overcoming her own skin troubles, she understands how important it is to be comfortable in your own skin. Abby’s goal is to educate each client on their skin and to show them that they can and will achieve a healthy and clear complexion by sticking with the Peaches natural, non-invasive approach. Maria is a local Cincinnati girl, is a licensed cosmetologist who ventured into the world of esthetics. She is very passionate about making people feel and look beautiful. She has struggled with cystic acne, and understands how important it is to feel good in your own skin. Peaches Skin Care has taught her how to have beautiful, radiant skin naturally! She loves to share her knowledge and let everyone to see how beautiful their skin can be! Danielle has loved everything beauty since she was a young girl. She moved to Cincinnati at the age of 12 and in middle school all of her friends let her try her homemade concoctions on them, everything from masks made of whatever she found in her mom’s cabinets, to hair products. After working in the customer service industry for four years, she realized her passion was beauty & skin care! Ever since she gave her first baby doll a make over (don’t worry, she’s improved since then), Jordan has loved everything beauty! She has struggled with acne and fungus as a teen and into young adulthood. After trying product after product, nothing helped until finding Peaches. In her free time, Jordan loves watching Family Feud and hanging out with her dog Zoey. Katie is a Cincinnati native who has been in the industry since 2006, Katie grew up working in a salon since the age of 15. There she discovered her passion for the industry and working with people. She struggled with her skin all throughout high school and into her early 20’s and felt helpless and uneducated about her skin until she became a Peaches client. After her first facial, she instantly fell in love with their holistic approach, loving atmosphere, and the results. Audrey was born in Ohio and raised in Montgomery who has found her life-long passion for Esthetics. Whether it's taking care of her friends or family, she feels as if making people feel better or their best is most rewarding to her. Peaches has taught Audrey the TRUE meaning of skin care and given her the ability to heal. She believes, "it's a beautiful thing when passion and career come together".